Wow I searched "Exogenesis" and this is the only thread that popped up. Is this really the only place that episode has been discussed? 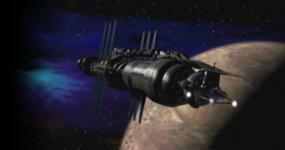 I was watching Exogenesis, Episode 3.7, and a question occurred to me - did JMS have other plans to use the Vindrizi or were they just introduced to introduce the concept symbiotic organisms? I ask this because they describe themselves a living records, which seems similar to another concept JMS introduced and never did much with ViCaRs. My point is that the Vindrizi would have been a VERY valuable ally to have in the Shadow War. Plus they would have been an extremely valuable asset to have around period. Of course it is mentioned that they want the secret kept because "Information is power. ", but doesn't it seem logical that we should have seen some attempt to tap that resource? I guess the answer to that question is if we didn't see the effort to tap that resource then JMS must not have intended for the Vindrizi to ever be referenced again. But maybe I am wrong. Anyone know a different answer? I've always suspected that the Vindrizi and the ViCaRs, like the technomages were based on first one tech of some sort. I doubt we'd have seen them again in B5. Whether we'd have seen them again in Crusade or Legend of the Rangers is another matter. Whether we'd have seen them again in Crusade or Legend of the Rangers is another matter. Very good point and to my point exactly. I wonder if JMS setup beings like ViCaRs and the Vindrizi with the intent that they might have been used in future episodes of B5 or in any expansion series or movie of the B5 Universe? Were the Vindrizi introduced simply to introduce symbiotic lifeforms, possibly to pave the way for the Keepers, or was he thinking he might want to use the Vindrizi if the opportunity presented itself in future episodes or future spinoffs/movies? I think it is very logical to assume that the Vindrizi would have shown up in Crusade. Franklin knew of their existence and knowledge base. It only seems logical that he would have given Gideon that information so he could search out those individuals he knew joined with Vindrizi. Last edited by Looney; January 23rd 18 at 15:17.